MANILA, Philippines -- The two final surviving leaders of a deadly siege in the southern Philippines, including a top Asian terror suspect, were killed Monday in one of the final battles by thousands of troops to retake the last area in Marawi city held by pro-ISIS militants, the defense chief and other top security officials said. 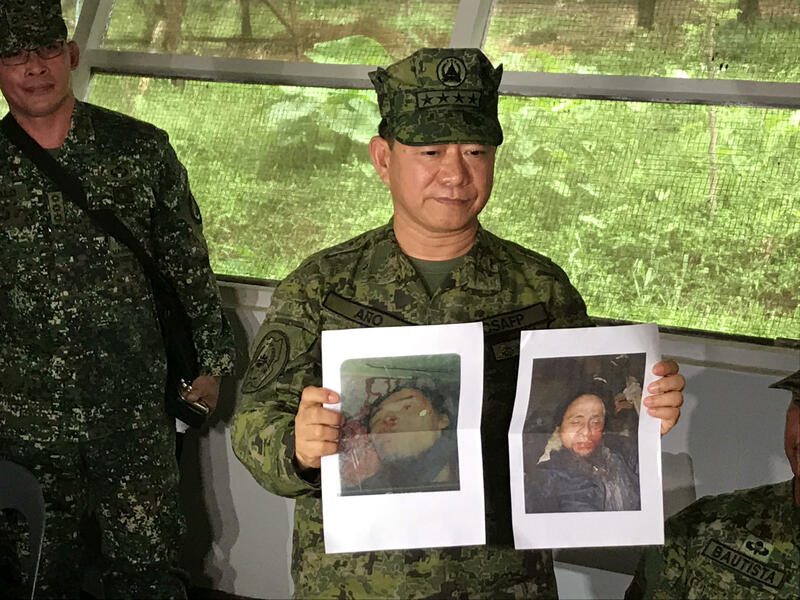 Four military and police officials told The Associated Press that Isnilon Hapilon, who is listed among the FBI's most-wanted terror suspects, and Omarkhayam Maute were killed in a gunbattle and their bodies were found Monday in Marawi. The officials spoke on condition of anonymity because they were not allowed to make a public announcement yet of the latest developments in Marawi, a mosque-studded center of Islamic faith in the south of the predominantly Roman Catholic nation. Defense Secretary Lorenzana later confirmed the militant deaths. "Yes, they are confirmed dead," Lorenzana said, adding DNA tests would be done on the remains of the two militant leaders to pave the way for the payment of huge U.S. and Philippine bounties offered for the two. The Philippine military chief said around 30 pro-ISIS militants, including fewer than eight foreign fighters, remained in the main battle area in southern Marawi city by Monday afternoon. Military chief of staff Gen. Eduardo Ano told reporters that 22 hostages and some 39 relatives of the militants also remained in the area. Ano said the foreign fighters still in the battle area include top Malaysian militant Mahmud bin Ahmad and some other Malaysian and Indonesian extremists. Mahmud uses the nom de guerre Abu Handzalah and is a close associate of Hapilon. Ano said 20 hostages were rescued Monday, including a 2-month-old baby girl born while her mother was in captivity. They bring to 1,771 the total number of hostages recovered since the start of the crisis. The U.S. State Department had offered a reward of up to $5 million for Hapilon, whom Washington blames for ransom kidnappings of several Americans, one of whom was beheaded in 2001 in southern Basilan province. Hapilon had been indicted in the District of Columbia for his alleged involvement in terrorist acts against U.S. nationals and other foreigners. Military leaders had said last month that three leaders of the militants who began the siege of the lakeside city on May 23 were killed in the months of fighting but the two still alive were leading a final stand. More than 1,000 people have been killed in the Marawi violence, including more than 800 militants. Army Col. Romeo Brawner said Sunday about 40 militants were still fighting in a small hilly residential area by Lanao Lake, including 100 relatives of the gunmen and civilian hostages. On Saturday, troops attempted to rescue several hostages but only snatched a 16-year-old female captive because of intense militant fire, which wounded an army battalion commander and more than 20 other soldiers, Brawner said. The rescued hostage provided the crucial information that allowed troops to locate Hapilon and Maute in one building, Lorenzana said. President Rodrigo Duterte declared martial law in the south, scene of decades-old Muslim separatist uprising, to deal with the siege, the worst crisis he has faced since rising to power in June last year. Duterte has gone to the battle area a number of times to rally the troops, once firing a sniper rifle toward militant position. He has vowed to have the militants killed to the last man because of the deaths and destruction wrought by the violence in Marawi. The Islamic city's 200,000 people, along with tens of thousands of others in nearby towns, abandoned their homes and businesses as the fighting began to rage and crammed evacuation shelters outside Marawi, sparking a humanitarian crisis. The siege has sparked fears that ISIS could gain a foothold in Southeast Asia by influencing and providing funds to local militants as it suffers battle defeats in Syria and Iraq. The United States and Australia have deployed surveillance aircraft to help Filipino troops battling the Marawi attackers.